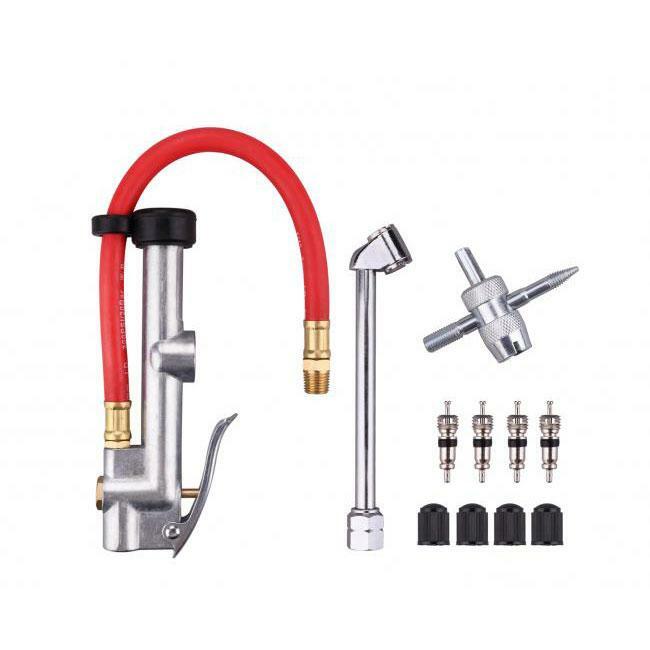 Heavy Duty Tire Inflator Gauge - Ningbo Sinppa Tools Co.,Ltd. This is our Dual Head Tire Inflator Gauge, which is ideal for industrial, home, or shop use. It has zinc cast alloy body with heavy duty brass internal parts, 6-inch chrome plated dual head chuck also included in the package. Magnifying bubble lens allows full view of the pressure scale and it has a 12 inch red heavy duty flexible air hose with a Standard 1/4 inch NPT female inlet. It provides you with easy and controlled inflation and comes with a-year warranty. 1 Piece 4-way tool, 4 Piece Valve cores, 4 Piece Plastic caps are all included in the case as a gift for you. Believe our tire inflator gauge will serve you for a long time!